A fire is probably the most comforting thing a human can experience. The only thing that comes even close is food. It stands to reason, then, that a fire smelling of food would be the most comforting thing of all, and that you could achieve peak comfort by cooking food on an open fire -- but this is 2018, and that sounds like a lot of work. Instead, you can buy this chicken log from KFC and easily bask in the roasting flesh of beasts, without actually setting an animal on fire in your home. To be clear, this is not actually called a chicken log, but it is a real product. 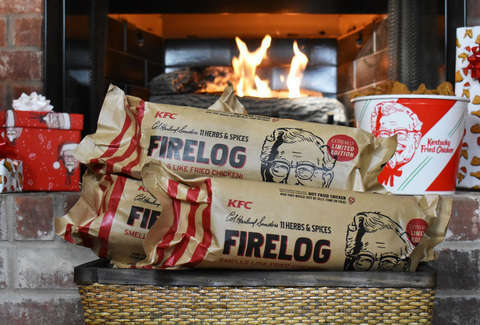 It's the 11 Herbs & Spices Firelog, "inspired by the Colonel's very own Secret Recipe," made in collaboration with Enviro-Log. As its proper name suggests, the log is scented like what KFC chicken is prepared in, not the chicken itself. But we know the truth. "At KFC, we have always been proud of our role in bringing loved ones together at the dinner table around a bucket of our world-famous fried chicken," Andrea Zahumensky, KFC U.S. CMO, said in a statement. "Now, this winter we're bringing all the things we love -- family, friends and fried chicken -- together around the fire with our scented firelog." According to the log's press release, this is "the perfect accessory for any winter gathering." It's hard to picture an appropriate occasion where you could casually throw this on a fire, but we're sure you'll think of one. The 11 Herbs & Spices Firelog will run you just $18.99, while supplies last, at www.KFCFirelogs.com. It'll probably make you hungry -- at which point, you can eat some real chicken.